The woodland Indians called this type of weapon a "Tomahawk.". Tomahawk is a word derived from the Algonquian language. It was only after European traders introduced metal hatchets that the word "Tomahawk" became linked with an axe like weapon. This particular tomahawk head is made from a naturally shaped stone from a river bed. It is bound onto a deerskin wrapped choke cherry handle, attached with rawhide. 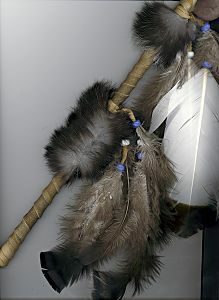 It is decorated with rabbit fur, turkey feathers attached with glass crow trade beads, and real buckskin fringes. The stone head is approximately 1 1/2 to 2" in length. Stone shapes will vary. The overall length is approximately 12 to 14 inches. The pictures shown are representative. Because this is a one-of-a-kind hand crafted item, each will vary slightly from the one pictured. If you have a preference for bead colors, specify your 1st and 2nd choices in the comment field of your order form. This item can be shipped internationally. However, some countries restrict the importation of feathers, so check with your local customs office before ordering. We are not responsible for items seized by customs inspectors. If additional shipping charges outside the continental US apply, we will contact you with the amount after your order is placed. As always, we will try to keep shipping costs as low as possible while still delivering in a timely manner. This tomahawk will make a great conversation piece for any artifact replica or miniatures collection. This product was added to our catalog on 01/09/2008.